A wide variety of factors comprise your individual chances of success in conceiving a child. The specific technique that was employed in your sterilization procedure is one of the most important factors in determining the success of a Tubal Ligation Reversal. There are five primary methods that are used for the female sterilization technique. We will review each of these procedures and the way that it may impact your chances for a successful reversal. In addition to the quality of the fallopian tubes, many other factors contribute to one’s ability to conceive. Age, general health, regularity of periods, quality of cervical mucous, quality of your partner’s sperm, history of venereal infections and previous surgeries, can affect your ability to become pregnant. Due to these varying factors, women who have been sterilized using the same technique may have different likelihoods of a successful reversal. Under ideal circumstances, the average chance of success with a Pomeroy sterilization is 75%, with a banding procedure 85%, and with a cautery procedure about 60-65%. Keep in mind that the specifics of your case will affect these percentages. The vast majority of women that Dr. Levin has performed reversals on conceive and deliver babies. It is important to remember that these high success rates are only obtained by those, like Dr. Levin, who perform these surgeries with such frequency and employ the most advanced equipment and techniques. With thousands of cases to his credit, Dr. Levin remains one of the most successful Tubal Ligation Reversal doctors in the United States, in terms of his experience and rates of success. This is the typical “cut and tie” method. Most commonly is it performed at the time of a C-section or on the day of a vaginal delivery. However the Pomeroy Method may also be used months or years after the delivery of a child. This technique usually involves surgically removing roughly ½ to 1 inch from the center of the fallopian tube and tying off the cut ends. In most cases, the surgeon will then lightly cauterize (burn) these cut ends to seal off small bleeding points. This conservative use of cauterization to stop minor bleeding should not be confused with the Laparoscopic Cauterization technique discussed below. 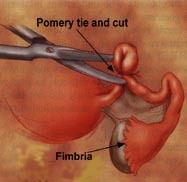 In order to determine if the Pomeroy Method was employed, check for a one to two inch incision, generally below the navel (belly button) that was used to remove a portion of the tube. The advantage of the Pomeroy Method is that the remaining fallopian tube remains in good physiological health. However, it is possible for the physician to remove too much tube, thus lowering the chances of success. All other factors aside, women who were sterilized with the Pomeroy technique are the second most likely group to have successful reversals. This procedure is generally performed as an interval procedure, in other words, not at the time of a delivery. The method involves inserting a small telescope through the belly wall just below the navel. The tube is grasped in the middle and usually about ½ to 1 inch is burned until the tube separates into two halves. This technique offers many advantages, as it is a quick and easy outpatient procedure that most women fully recover from within a day or two. 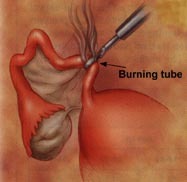 However, there are also drawbacks, as the heat from the cauterization may damage the health of the tube to some degree. If you have been sterilized using this technique, don’t be discouraged. Even the majority of these patients are able to conceive after their reversal is performed. In fact, Dr. Levin has performed pioneering work in the United States by successfully reversing even the most difficult triple burned tubes. These three procedures are all very similar. Like the LTC procedure, they are done as interval procedures. These methods involve inserting a small telescope through the belly wall just below the navel. Grasping the tube in the middle, a silastic (rubber) band, Hulka clip or metal clip is used to pinch off a very small part of the tube. Each of these devices is similar to putting a clothespin on the tube and squeezing off a small portion. After several days, the pressure of the device causes the tube to separate into two separate halves. The advantage of this procedure is that the tube is left in superb physiologic condition. 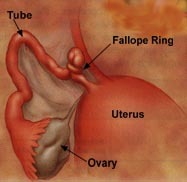 Moreover, only a small portion is removed, leaving plenty of the fallopian tube for the reversal procedure. There are really no disadvantages to these procedures and accordingly they yield the highest rates for successful reversals.